Congressional Democrats and Republicans regularly play the blame game about why there’s no immigration reform. But each party fails to point the finger at one of the major culprits behind the contemporary immigration waves and this political morass: NAFTA. The Trump administration’s decision to rescind DACA prior to the passage of the DREAM Act was unethical because it overlooked the connection between the presence of undocumented youth and multinational free-trade policies. DACA (Deferred Action for Childhood Arrivals) existed because Congress repeatedly failed to pass the Development Relief for Alien Minors Act, commonly known as the DREAM Act, between 2001 and 2012. While the DREAM Act is a bipartisan bill with bipartisan support that would lead to permanent residency for undocumented youth, DACA was an executive action signed by Obama that granted temporary legal status and work permits to undocumented youth in exchange for registering with Homeland Security and going through a stringent vetting process. These “dreamers” and their families live in the United States due to, in part, economic choices the United States has made. The origins of NAFTA reach back to the late 1970s. On the campaign trail in 1979 and 1980, Ronald Reagan called for a “North American Accord” between the U.S., Canada, and Mexico that would create an economic partnership and safeguard the region from the Soviet Union’s political and economic reach. By 1989, NAFTA’s precursor, the U.S.- Canada Free Trade Agreement, was law, and in 1992 George H.W. Bush began the process of developing and negotiating NAFTA while campaigning against Bill Clinton. In December of 1992, Bush signed NAFTA before Clinton took office. During Clinton’s first year as president, he added two side agreements to NAFTA — the North American Agreement on Labor Cooperation and the North American Agreement on Environmental Cooperation. These additions sought to protect workers, defend the environment, and appease progressive politicians who were wary of NAFTA. With these changes Congress passed the North American Free Trade Agreement Implementation Act in November of 1993, Clinton signed the final version a month later, and on January 1, 1994 the law went into effect. 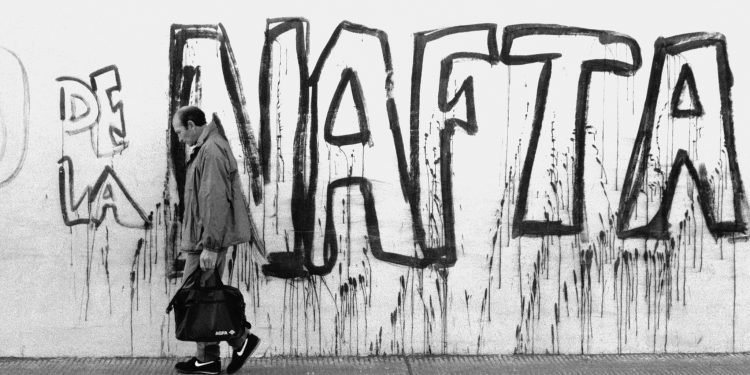 NAFTA was intended to “remove most of the tariffs and restrictions on trade between [the U.S., Mexico, and Canada] and [codify] a wide range of agreements on agricultural, textile and auto trade, as well as telecommunications, intellectual property, mobility of workers and environmental policies.” While these ideas seemed good on paper, the AFL-CIO vehemently opposed the implementation of the law because of the effect it would have on workers in all three nations. According to a report from the UCLA Center for Labor, the hesitance from labor unions proved to be correct, especially for working-class women and men in Mexico. Following the implementation of NAFTA, the World Bank found that the rural poverty rate in Mexico increased significantly between 1994 and 1998, and continued to rise into the 2000s. Economic challenges faced by workers, however, were not relegated to farmers who struggled to compete with the influx of American agricultural goods, but also experienced by women and men in cities. Truck drivers and those who worked in manufacturing plants quickly lost their jobs. And by the early 2000s when U.S. politicians began to clamor about American corporations that outsourced labor to Mexico for cheap production, what Mexican workers experienced was the harsh reality that many manufacturers, American and Mexican, actually outsourced labor and production to China. While NAFTA did create an environment where goods could move across borders more freely, it did not provide the same safeguards for jobs or protect workers’ rights to collectively bargain. Mexico’s constrained economy and the resulting rise in the cost of living for working-class women and men forced a new wave of immigration into the United States. Today, according to the Pew Research Center, the majority of those who live in the U.S. without papers are of Mexican origin and immigrated after 1994. Many of these women and men are those who sought refuge from the economic condition produced in part by NAFTA, and their children are the “dreamers” who have become political pawns in a national battle for immigration reform. David Bacon, writer and former union organizer, deemed “dreamers” the “true children of NAFTA” who “more than anyone else, have paid the price for the agreement.” In many ways, Bacon is right. The young women and men who stand at the center of the political fray and immigration debate were born into a world that had little regard for their humanity and perceived their poor quality of life as an inconvenient factor in global economic growth. While ensuring safety for undocumented youth and passing the DREAM Act before the Trump administration’s arbitrary March deadline is essential — it should and must be the first step in a progressive process toward more humane immigration policies. The United States shares the blame for the struggle of the mothers and fathers of “dreamers” who risked everything to provide a sense of safety and opportunity for their children once those doors closed in their home nations. These older immigrants are not “criminals” but Americans who have made the United States their home. Sarah McNamara is a professor and historian whose work centers on Latinx, women and gender, and labor in the modern United States. "They're Not Sending Their Best"